…or any other ordinary year that’s not a major milestone for that matter? Yes! Such a year is not a well celebrated milestone anniversary like the 1st, 5th, 10th, or any other significant digit anniversary. However, it’s one highly effective way of rekindling the relationship. Basically, you’re expressing that every year spent with your partner is special, important, and significant. In this particular case, my 6th year wedding anniversary was around the corner. And it’s special because my spouse and I still feel like newlyweds (We thank God everyday for such a relationship because some say it’s rare by the 6th year especially with kids…). Hence, I wanted to make a special and creative anniversary card that would express that. The smiles and expressions I got confirmed that I achieved that goal. And I hope this card will help you achieve the same goal. There are numerous ways to put together greeting card phrases. The challenge here is to express sincerity that flows properly through 5 pages without sounding awkward. From the pictures, you already know that the anniversary card message in this card points out the number of years together. Alternatively, simply come up with your own greeting card messages. Silver, why does this color ring a bell? Okay, we've established that this is a great wedding anniversary card for any year. However, since silver is the theme, it's perfect as a 25th year anniversary card. This is because 25 years is called Silver Jubilee. For other themes, use the symbol of that theme in the greeting card. In this fashion, for a 50th year anniversary, simply replace the silver corrugated cardstock with gold-colored one. And voila! The transformation is complete! You’ve now turned it into a Golden Jubilee card! ...Last year when I made this unique love card with petals, did you notice that I had my 5th wedding anniversary in mind? That was why I used the actual leftover petals from my wedding. Also, even with no words on the cover, this card's wedding anniversary message alternative has an interestingly simple math that relates to this as well. 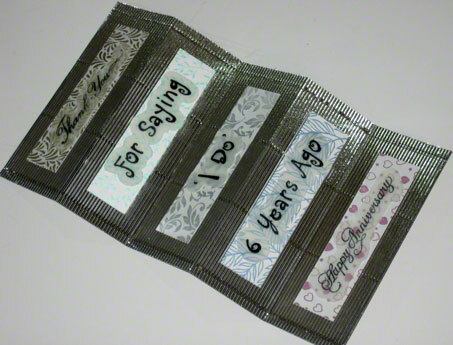 Do you see how this idea can help you with your own wedding anniversary card project? Cut out five 1.25” x 8.5” strips from the 8.5” x 11” pastel grey cardstock. 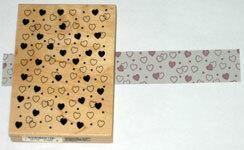 Use the rubber stamps and the metallic pink ink pad to create the heart shaped background on one of the five strips. The pastel gray strips are much smaller than the stamp face. Hence, place a sheet of paper underneath the strip to prevent ink stains. On the frosted translucent plastic sheet, use the rubber stamps and black ink pad to print out the wedding anniversary card message. 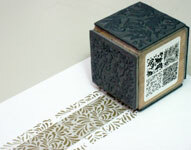 Draw and cut out a rectangular shape around each of the five stamped greeting card messages. Remove only one side of the double sided adhesive sheets and glue the cut out rectangular messages to them. Then cut between each message to separate the different rectangular greeting card messages. 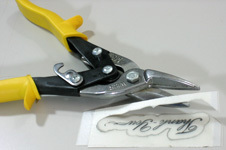 Place a sheet over the adhesive side so that it doesn’t stick to your scissors. 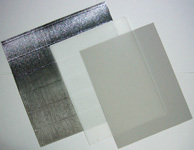 Without this, the adhesive side makes cutting difficult and it’s very tough to clean up. Use the pencil to draw a silhouette around the greeting card messages with about 0.25” margin. I added a second frosted translucent sheet because one sheet was too transparent and was not legible. Hence, a second sheet made the background opaque enough for the letters. Cut along the pencil marks of the silhouette. 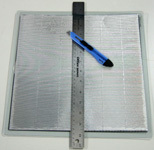 The double thickness could make it difficult to cut the sheet with scissors. If this is the case for you, using a pair of shears from your arsenal of greeting card supplies could make it easier. 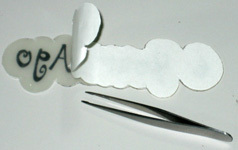 Use your tweezers to peel off the second side of the double sided adhesive sheets. 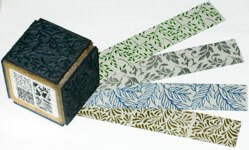 Then glue this side of the adhesive sheet on the colorfully stamped grey cardstock strips. 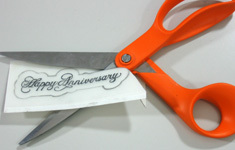 Remember to place the “Happy Anniversary” one on the heart shaped background strip. On the silver corrugated cardstock, cut out a 6.5” x 12” piece. 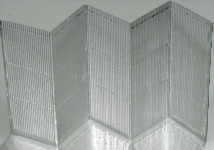 Don’t use a scissors for this as this could squash and deform the corrugated shape as shown here. Use a craft cutting knife on a cutting mat instead. Score and fold the corrugated sheet into a five-page accordion greeting card format. Finally, glue the five grey cardstock strips on the center of each page of the accordion. The accordion cardstock is able to fold and create five rigid pages because there’s a flat piece of cardstock on the back of the accordion. Hence, if yours doesn’t have it, consider adding one yourself.